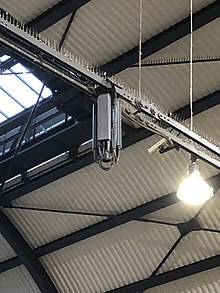 The increased capacity in a cellular network, compared with a network with a single transmitter, comes from the mobile communication switching system developed by Amos Joel of Bell Labs that permitted multiple callers in the same area to use the same frequency by switching calls made using the same frequency to the nearest available cellular tower having that frequency available and from the fact that the same radio frequency can be reused in a different area for a completely different transmission. If there is a single plain transmitter, only one transmission can be used on any given frequency. Inevitably, there is some level of interference from the signal from the other cells which use the same frequency. This means that, in a standard FDMA system, there must be at least a one cell gap between cells which reuse the same frequency. The first commercial cellular network, the 1G generation, was launched in Japan by Nippon Telegraph and Telephone (NTT) in 1979, initially in the metropolitan area of Tokyo. Within five years, the NTT network had been expanded to cover the whole population of Japan and became the first nationwide 1G network. Cell towers frequently use a directional signal to improve reception in higher-traffic areas. 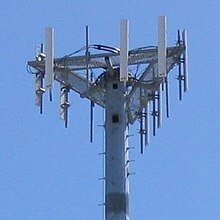 In the United States, the Federal Communications Commission (FCC) limits omnidirectional cell tower signals to 100 watts of power. If the tower has directional antennas, the FCC allows the cell operator to broadcast up to 500 watts of effective radiated power (ERP). ^ a b c d Guowang Miao; Jens Zander; Ki Won Sung; Ben Slimane (2016). Fundamentals of Mobile Data Networks. Cambridge University Press. ISBN 1107143217. ^ Tom Simonite (24 January 2013). "Google's Private Cell Phone Network Could Be a Threat to Cellular Carriers | MIT Technology Review". Technologyreview.com. Retrieved 23 November 2013. ^ "Be Mobile, Stay Connected | PMN". Privatemobilenetworks.com. Retrieved 23 November 2013. ^ U.S. Patent 3,663,762, issued 16 May 1972. ^ J. E. Flood. Telecommunication Networks. Institution of Electrical Engineers, London, UK, 1997. chapter 12. ^ "Phone Networks". The Reverse Phone. 8 June 2011. Archived from the original on 30 April 2012. Retrieved 2 April 2012. ^ Pauli, Volker; Naranjo, Juan Diego; Seidel, Eiko (December 2010). "Heterogeneous LTE Networks and Inter-Cell Interference Coordination" (PDF). Nomor Research. Archived from the original (PDF) on 3 September 2013. Retrieved 2 April 2012. ^ "Cellular Telephone Basics". Privateline.com. 1 January 2006. p. 2. Archived from the original on 17 April 2012. Retrieved 2 April 2012. ^ Paetsch, Michael (1993): The evolution of mobile communications in the US and Europe. Regulation, technology, and markets. Boston, London: Artech House (The Artech House mobile communications library). ^ Colin Chandler (3 December 2003). "CDMA 2000 and CDMA 450" (PDF). p. 17.